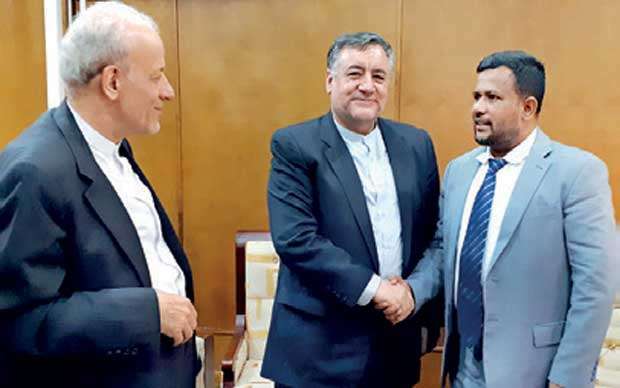 Sri Lanka will look to diversify exports to Iran after Tehran proposed to host the island to a round of trade negotiations this August, the Industry and Commerce Ministry said. Iran’s envoy to Colombo Mohammad Zaerl Amirani yesterday said Tehran was keen to host the 12th Session of the Joint-Commission for Economic Cooperation (JCEC) between the two countries by early as August 2018, according to a statement issued by the Industry and Commerce Ministry. “Tea accounts for 90 percent of our exports to Iran and it’s time to diversify our exports basket. The August JCEC meeting can help us achieve this,” Commerce Minister Rishad Bathiudeen said. The last time the joint commission met was in February 2016. The joint commission was established three decades ago. The renewed interest in reviving bilateral trade negotiations follows President Maithripala Sirisena’s visit to Iran where he met with President Hassan Rouhani, who had stressed the importance of the joint commission, according to the statement. “This JCEC can help grow our trade numbers, which is in need of a boost,” Amirani said. Trade between the two countries totalled US $ 188 million in 2017, growing 4.5 percent from a year earlier, with Sri Lanka’s exports to Iran amounting to Rs.177 million. Imports from Iran amounted to just Rs.11 million on fish, cables and wires, grapes and plastic items. Iranian imports had topped Rs.1.4 billion in 2011 dominated by oil which was cut-off by US sanctions since 2013. During President Sirisena’s recent visit to Iran the two countries signed several agreements covering drug trafficking, health, standardization, film industry and exchange of students, the Industry and Commerce Ministry said.